Check out my Fund My Travel page for updates, information, and to donate! As an occupational therapist, I help individuals of all ages increase their independence, engage in meaningful activity, and achieve their personal goals. In addition to being a dedicated healthcare professional, I am an avid traveler. I’ve been to places all over the United States, Puerto Rico, and even Nicaragua! However, I’ve never had the opportunity to travel to the eastern part of the world and experience the culture, language, and opportunities that exist there. Between working, spending time with family, and volunteering in multiple organizations, it’s been difficult to find time to travel. But I’m always on the lookout for great opportunities to serve and explore the world! Several years ago, I was watching the Olympic Games and wondering how such a large-scale, high-stakes international event was organized every couple of years. After doing a little research, I learned that Olympics volunteers were a huge part of the equation, and that thousands of people from all over the world were selected as support staff for each Olympics event! Then my wheels began to turn…and it all made perfect sense! Healthcare professional + Avid traveler = Olympics volunteer! As soon as the 2018 Winter Olympics volunteer application opened in July 2016, I entered my information and buckled down for the long wait. Click below to learn more about my journey to becoming a 2018 Winter Olympics volunteer, and how you can help send me to South Korea! If so, then you should sign up to volunteer at the 2016 AOTA Annual Conference & Expo in Chicago, Illinois! I volunteered at the Baltimore conference a couple years ago for practically nothing, and it was easily one of the highlights of my early OT experience. I was also able to attend last year’s conference in Nashville, and the time I spent there just confirmed that I had chosen the perfect profession. There were volunteers of all ages and stages at the conference, including retired OTs, veteran volunteers with 10+ years of experience, current and future OT students, and others. Don’t let your age, student status, or anything else deter you from serving in Chicago this spring! You don’t have to be an AOTA member to volunteer – but you’ll probably want to be one when you’re done! In addition to helping support and promote one of the fastest-growing, influential, and dynamic professions around, there are several other benefits that come with being a conference volunteer. Read on to find out more about why volunteering will be the best thing you can do for yourself and your career in OT! Meet some of the most influential people in the profession. As a conference volunteer, you have the chance to meet the people whose blogs you read, whose papers you’ve referenced, and whose Twitters you follow in person! Rubbing elbows with such accomplished (and really nice) people is a major high and a can’t-miss networking opportunity! Cut the cost of attending Conference. Conference attendees must pay nearly $300 simply to attend, and that’s the student rate – not including travel, food, lodging, and other expenses! But volunteers can view special exhibits, attend one or two sessions, and see the posters for FREE. As a volunteer, you won’t necessarily be able to attend the session of your choice or participate in all events, but you will get to experience many of the best parts of the conference without paying for much of anything! Pro Tip: Check with your OT program, graduate student association, or employer to see whether there are special funds available to help cover your travel and other expenses. Attend the Expo for FREE! Where else in the world can you get a TON of free stuff in exchange for just a few hours of your time? Just think: in the time it took you to sit through one overly long OT school class, you could be having fun, making friends, and earning your way into the Expo. You don’t have to be a math whiz to see that this is too good a deal to pass up! Note: Only AOTA Marketplace/Member Resource Center volunteers can earn this privilege. Diversify your resume and grow your professional experience. Volunteering at the national conference shows that you are involved and invested in your national professional association and your profession as a whole. 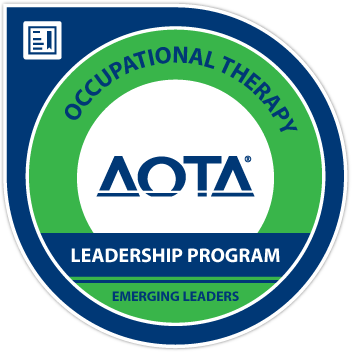 Whether you are planning to apply for a leadership or volunteer position with AOTA, a position in your state OT association, or even a job, having a record of service to the profession will definitely give you a boost. Make a difference and be an advocate for OT. Have you ever wondered how all those bags get stuffed, how all those signs get posted, or how an event with thousands of attendees seems to run so smoothly? It’s not magic – it’s volunteers! 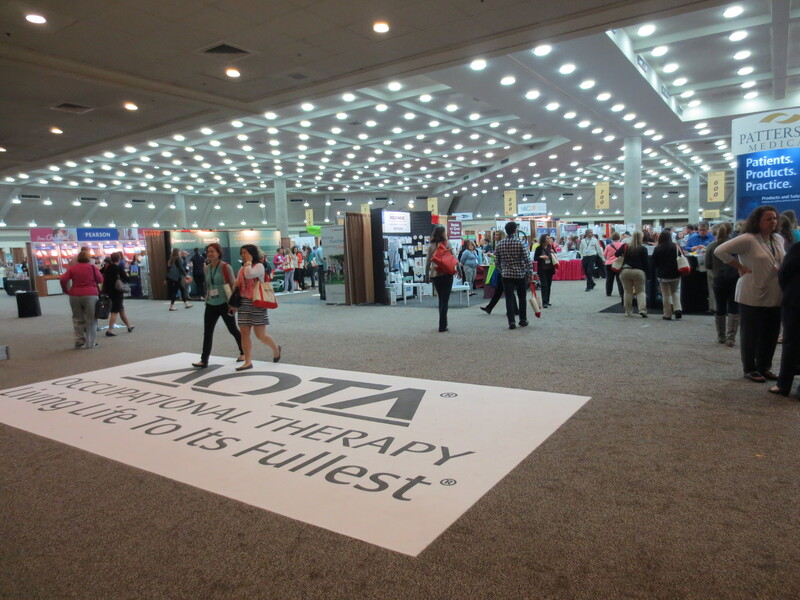 By serving as a conference volunteer, you can be a part of the team that makes the AOTA Annual Conference such an amazing experience for attendees from across the U.S. and around the world and have a great time while you do it! Network with students and faculty members from OT programs across the country. While I served as a conference volunteer, I had the opportunity to talk with fellow OT students, meet instructors from numerous OT programs, and exchange ideas and information with a variety of people. Volunteering at conference is a great way to meet people who may have similar interests to yours, so be sure to keep those business cards handy! An amputee uses a newly designed prosthetic hand to “sense” the shape and resistance of objects he cannot see. I was out to lunch with a couple of friends today, celebrating the end of the semester and maybe the last time I’ll be seeing them for a while, with graduation right around the corner. We were chatting about our plans for the future and the crazy professors we’d had during school, and somehow we got onto the topic of neuromedicine and prosthetics. In just a few seconds, a conversation about the CGI and facial-recognition software used in the Planet of the Apes and Avatar movies turned into a passionate discussion about how much my friend Jon and I wanted to be involved in work with prosthetics in the future! I’ve known Jon for about four years because we’ve been involved in the same club, but this is the first time I’d ever gotten the chance to talk to him about his career interests. I love getting to know people – and spreading the word about occupational therapy – so I definitely wanted to learn more about his experience with prosthetic technology and talk about my plans to work with polytrauma patients in the future. Jon is a double major in neuroscience and kinesiology and he started telling us about DARPA (Defense Advanced Research Projects Agency), a military contracting company, and how it works to design and build the world’s most advanced, human-like and functional prosthetics (among many other projects). As he began explaining more about DARPA and a new type of prosthetic they might be trying to develop, I had an eerie feeling of déjà vu. Why the déjà vu, you ask? This morning I was volunteering and I had JUST read an article in Rehab Management’s monthly magazine about the new technologies being developed and used in hand therapy. This article was particularly interesting because I had not known about the development of this amazing sensory discrimination prosthetic technology before. I thought the article was so cool that I made a copy and brought it home to read through and potentially write a blog post about. So it was crazy when I ended up at a burger joint this afternoon with somebody who knew about and who was just as excited about this sensory prosthetic technology as I was! It is a really engaging article, and it discusses many of the new developments in hand therapy, prosthetic technology and therapeutic treatments that I hope to learn more about in the future. Definitely worth the read! So that was my day – I go out to lunch to relax with friends and end up getting all excited when I realize that everyone I know is secretly a nerd like me! 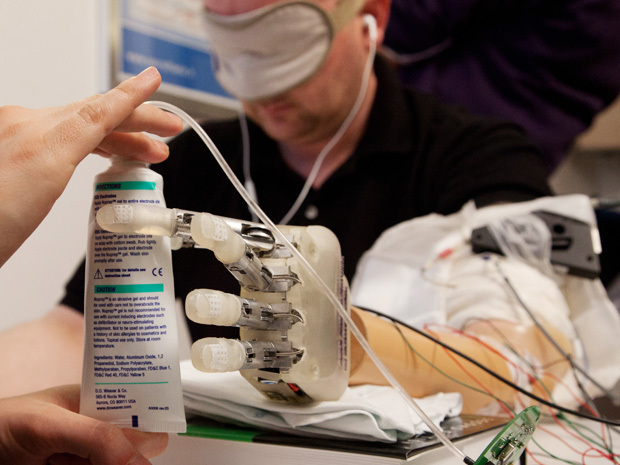 Have you heard about this “sensory” prosthetic technology being developed? Do you think it will be a useful development for people who use prosthetic limbs?